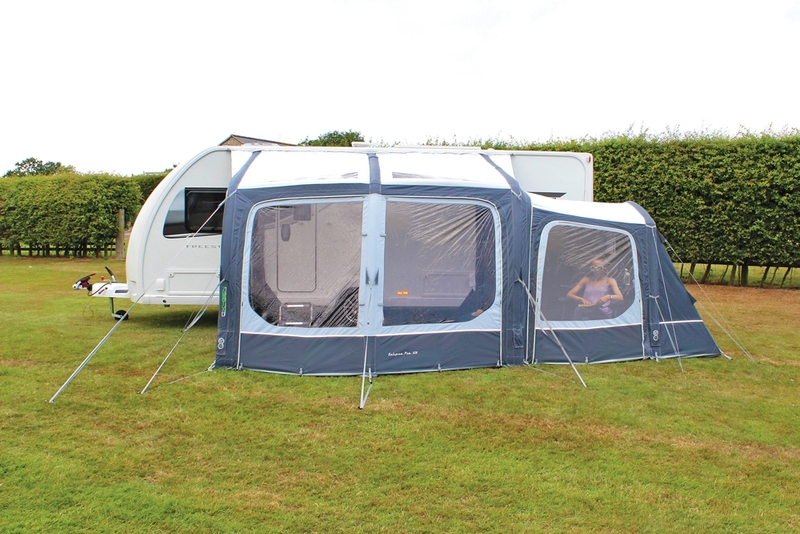 This fantastic single inflation point two berth annexe, designed to function as either an additional luxurious sleeping extension with maximum privacy, or alternatively as a convenient conservatory space, granting further living or storage space to the ‘Ecipse 325 Pro' and 'Eclipse 420 Pro' caravan awnings, encompassing an excellent vista of the surrounding outdoors. 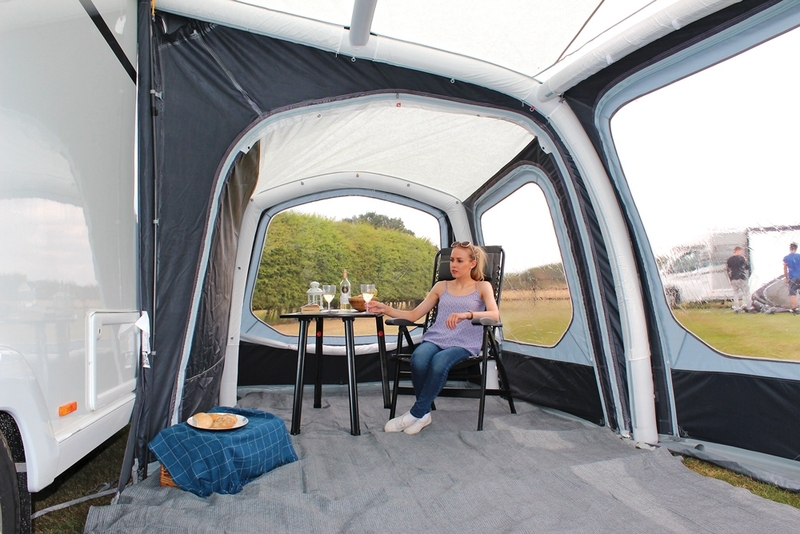 The accessory enjoys an ambidextrous fit, therefore can be zipped to either side of these awnings, plus it comes complete with an internal divider to effectively separate the living/sleeping areas, traditional style sliding curtains for optimal privacy and an elevated sense of homeliness, as well as a breathable clip-in micro-polyester two person inner tent to safely house a double air bed, two adults, or three children, should you desire extra luxurious sleeping space. Are you looking for the Eclipse Pro Conservatory Annexe (2019)? 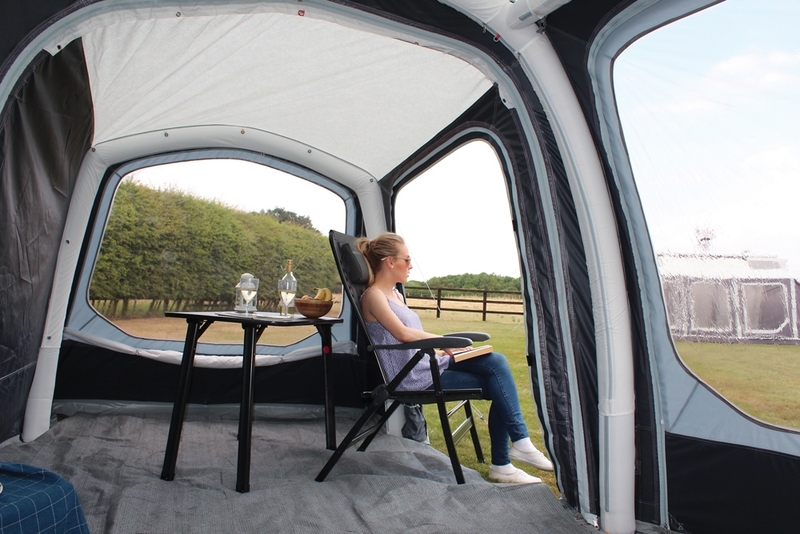 This fantastic single inflation point two berth annexe, designed to function as either an additional luxurious sleeping extension with maximum privacy, or alternatively as a convenient conservatory space, granting further living or storage space to the ‘Ecipse 325 Pro' and 'Eclipse 420 Pro' caravan awnings, encompassing an excellent vista of the surrounding outdoors. 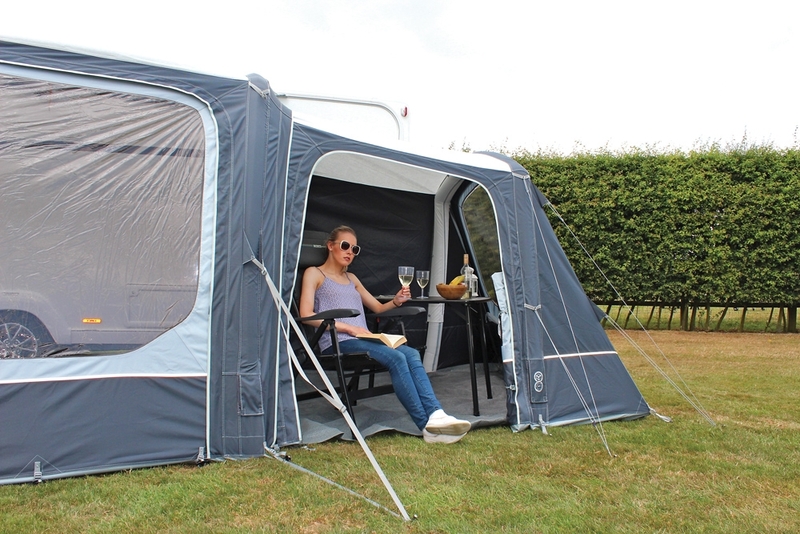 The accessory enjoys an ambidextrous fit, therefore can be zipped to either side of these awnings, plus it comes complete with an internal divider to effectively separate the living/sleeping areas, traditional style sliding curtains for optimal privacy and an elevated sense of homeliness, as well as a breathable clip-in micro-polyester two person inner tent to safely house a double air bed, two adults, or three children, should you desire extra luxurious sleeping space. 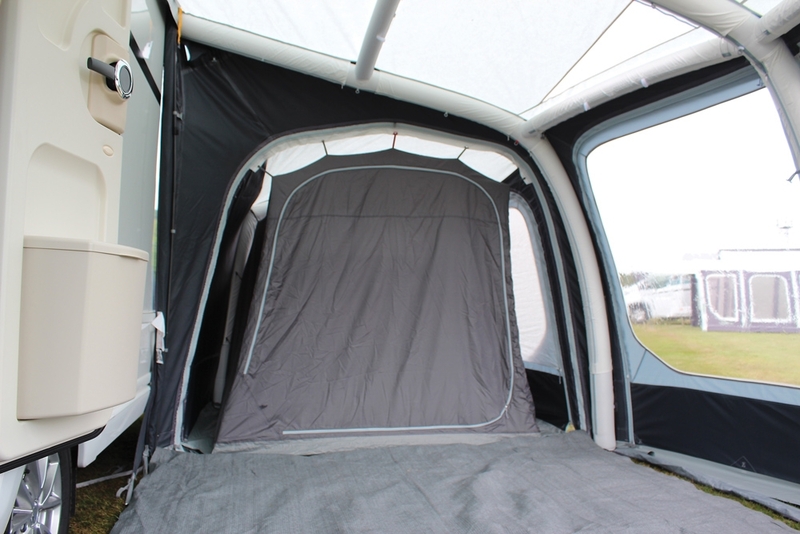 Zip-back side doors enable quick and easy access to the annexe, without having to traipse through the awning. Tinted windows reduce glare and increase privacy, whilst the roof light window helps to maintain a light and airy interior; the addition of these window panels aids in creating a more relaxing environment for the user. Pro 800HD Fabric - Traditional Feel, Fade Resistant, All Weather Premium Fabric Weave Ensuring Longevity. Single Point Inflation Air-Frame - Fast Pitching Oxygen Air Frame from One Inflation Point. Lifetime Guarantee - On the 'Oxygen Air-Frame' Against Any Manufacturing Faults. Dynamic Speed Valve - The Quickest, Simplest & Most Reliable Inflation Valve on the Market. Intelligent Frame Relief Valve Protection System - Our Patented Pressure Relief Valve to Prevent Over-Inflation, Expelling Excess Air Above 6PSI. Tinted Windows - To Reduce Glare, Increase Privacy & Create a More Comfortable Environment. 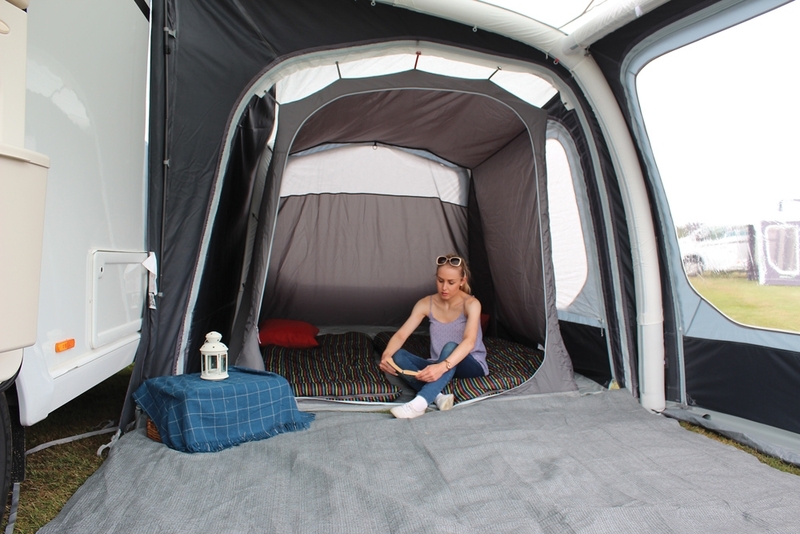 'Twilight' Two Berth Micro-Polyester Inner Tent - A Dark Coloured, Breathable Clip-In Inner Tent, Designed to Luxuriously Sleep 2 Average Adults or 3 Children. Divider Door - A Toggle-In Door to Fully Seal Off the Conservatory, Complete with a Central Zip. Traditional Sliding Curtains - Classic-Style Curtains with a Modern Leaf Print Design Offering Further Privacy & A Sense of Homeliness. Roof Light Window - Contemporary Roof Light to Help Maintain a Light and Airy Interior. PVC Draught Exclusion - To Maintain a Comfortable Temperature & Trap Warmth Inside the Annexe. Reflective Guylines - High Visibility Guylines to Reduce the Risk of Tripping. Two Zip-Back Side Doors - Strategically Positioned to Enhance Ease of Access. Zip-Back Rear Door - Strategically Positioned to Enhance Ease of Access. Left and Right-Hand Fitting - Ambidextrous Fit for Maximum Convenience. Walk In Height - Ergonomic 195cm Tall Doorways Enabling the Majority of Outdoors Enthusiasts to Simply Walk In. Compatible with 'Eclipse 325 Pro' & 'Eclipse 420 Pro' Models.